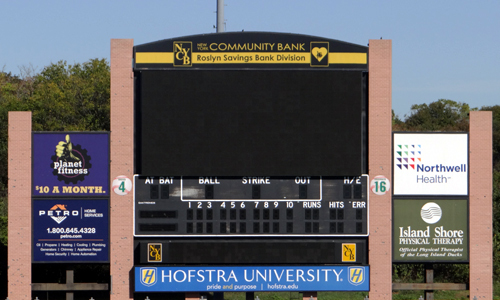 Bethpage Ballpark features a brand new state-of-the-art scoreboard that is the center of attention for fans enjoying a game or outside event. The Ducks offer a variety of sponsorship options using the DuckVision Scoreboard/Videoboard. 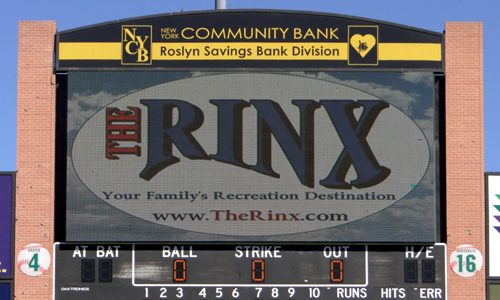 Advertise your company with a backlit sign located on the scoreboard. These signs are located in a prime location and noticed by all fans taking notice of the information on the scoreboard. All companies receive category exclusivity on the scoreboard. Title Panel: Located on the top of the scoreboard. A great way to have your company logo and a short message to get the attention of the crowd! DuckVision messages are 30-second non-audio clips displayed on the DuckVision scoreboard at Bethpage Ballpark. The clips include a company logo and message while the opposing team is at bat. DuckVision comes in a single package (3-4 30 second spots per game) and a double package (7-8 30-second spots per game). 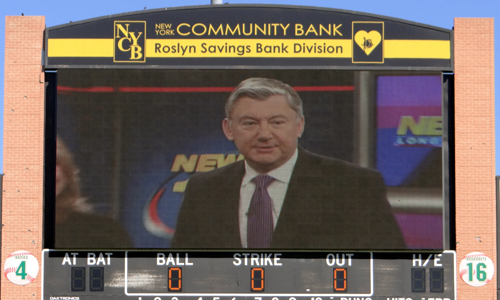 Simply put, this is the most cost-effective way of advertising your company on the Bethpage Ballpark scoreboard. Have your 30-second commercial (with sound) played at Bethpage Ballpark before or during the game. All commercials include a PA introduction.